London: William Heinemann. Near Fine in Fair dust jacket. 1953. First Edition; First Printing. Hardcover. First edition 1953. Hardcover/Jacket - near fine/fair. Pages are clean and intact, with no markings, light age tanning to interior. Hardcover has a little bumping to edges and spine ends and one very light stain on front. Dustjacket has age tanning and numerous edge tears and chips, light soiling, light ink rubbing, not price clipped. This science and science fiction writer's foray into discussing politics and world affairs. In the essays he also discusses humanity, civilisation, and the challenges of atomic age. (245noto,0914) ; 12mo 7" - 7½" tall . Dundurn Group. Near Fine. 2003. First Edition. Softcover. 1550024671 . Excellent condition. Interior pages are clean, tight and unmarked. Cover has light scuffing and a little wear to corners. 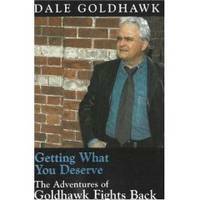 ; 8vo 8" - 9" tall; 272 pages; For 12 years Dale Goldhawk journeyed through the streets of Canada and into the hearts of thousands of Canadians. Written in Goldhawk's punchy, to-the-point style, this book links his life as a journalist and advocate with those who were his clients. For the first time, he reveals the background battles and adventures he and his team had, as well as the stories of his clients and where they are today. The narrative paints a vivid picture of how working on Canada's most original advocacy team changed their lives as journalists and Canadians. [391-osl] . Cambridge University Press. Very Good+. 1999. First Edition. Softcover. 0521658837 . Very nice condition. Pages are clean, tight and unmarked. Cover has light scuffing and light wear to corners. Price sticker on rear. 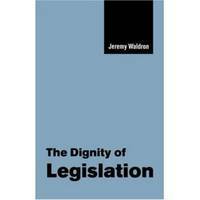 ; The Seeley Lectures; 8vo 8" - 9" tall; 220 pages; In a lucid, concise volume, Jeremy Waldron defends the role of legislation, presenting it as an important mode of governance. Aristotle, Locke and Kant emerge as proponents of the dignity of legislation. Waldron's arguments are of obvious importance and topicality, especially in countries that are considering the introduction of a Bill of Rights. The Dignity of Legislation is original in conception, trenchantly argued and very clearly presented, and will be of interest to a wide range of scholars and thinkers. [312-osl] . The University of Alberta Press. Near Fine. 1999. First Edition. Softcover. 0888643578 . Excellent condition, clean and unmarked. Light corner wear and slight scuffing to cover. B/w illus. ; 8vo 8" - 9" tall; 184 pages; Today, housing, health, and education services are desperately needed for the world's poorest people, but instead governments spend billions on war. With six billion people on the earth, social justice sometimes seems farther off than ever. 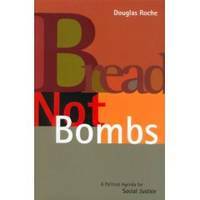 Senator Douglas Roche envisions a new future, with increased awareness of key global issues, where bread, not bombs, is the priority. Senator Roche's strong belief that human security is possible is complemented by a persuasive agenda for the 21st century. First, the international community must build the conditions for peace through nuclear disarmament. Second, nations must Co-operate to ensure equitable economic and social development. 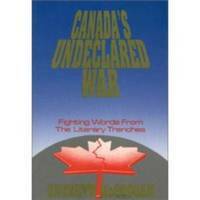 He foresees Canada taking a crucial role, building on its international reputation as a peacemaker. [261-osl] . Henry Holt. Very Good. 1987. First Edition. Softcover. 0805003576 . Pages are clean & tight, light ink discoloration bottom edge of pages. Light edgewear to cover. Cover has slight bend to it. Translated from the Hungarian. "Hungarian novelist Konrad blames the U. S. And the Soviet Union in equal measure for the threat of nuclear annihilation that hangs over the world, and he calls for the creation of an independent European confederation. 'A courageous and provocative rallying cry," [340-noto]; 8vo . Oxford University Press, USA. Good+. 1983. First Edition. Softcover. 0195031164 . Cover has some scuffing, light edgewear, corner curling (moreso to bottom corner) . Internal pages are tight an clean other than name/date written on endpage and approx. 6 pages with pencil underlining. "In this classic text, an eminent historian of international affairs and a distinguished political scientist survey the evolution of the international system, from the emergence of the modern state in the 17th century to the present. 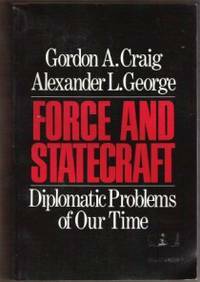 Craig and George pay particular attention to the nineteenth century's "balance-of-power" system, the basic tenets of which still determine many applications of modern diplomacy. ..." [407-noto]; 8vo 8" - 9" tall; 288 pages; . By Baldwin, R. M. & J.
Ontario: Longmans Canada Ltd.. Fine in Near Fine dust jacket. 1969. First Edition. Hardcover. Very nice condition. Hardcover is clean, tight and unmarked. Jacket has light edgewear, a little scuffing & a few tiny tears. "The Baldwins of this book are those of the first three Canadian generations of a family that sailed from Ireland to Upper Canada in 1799 and which, before the end of the following half century, had left an indelible mark on Canadian political life. The Great Experiment was the introduction of responsible government which gave to the British Empire another century of life...."  ; 8vo 8" - 9" tall . Peter Martin Associates. Very Good. 1975. First Edition. Softcover. 0887781225 . Clean, tight condition. Internal pages unmarked. Cover has light edgewear, edge rubbing, light creasing. 147 pages. "More than 750 memorable statements by 'The Chief' some hilarious, some profoundly moving. " [osl-175] ; 8vo . Calgary, AB: Detselig Enterprises. Very Good. 1991. First Edition. Softcover. 1550590324 . Light edge and corner wear, light creasing/scuffing to covers. Soiling to bottom edge of pages. Internal pages clean and unmarked. 277 pages. "Drawing on more than a decade's experience as a literary journalist, McGoogan argues that an undeclared war is raging in Canada on a variety of fronts: French-English, Canadian-American, East-West, native-white, the list goes on. And that Canadian writers are in the thick of every battle. " ; 8vo 8" - 9" tall . Macmillan Canada. Very Good. 1968. Third Printing. Softcover. Light edge & corner wear, crease to spine, some rubbing to edges. Internal pages unmarked, age tanning to pages. Includes are some of the most important pieces done by Trudeau on federalism and the French-Canadian society - taken from his various speeches from 1964-1967. (*shipping will be reduced to some locations) [os]; 8vo 8" - 9" tall . By Krause, Robert M. & Wagenberg, R. H.
Copp Clark Pitman. Very Good. 1991. First Edition. Softcover. 0773051309 . Clean, tight condition other than several pages near rear of book with highlighting. Cover has light edge & corner wear. 412 pages. ; 8vo 8" - 9" tall . St. Martin's Press. Very Good. 1987. Softcover. 0312108508 . Cover has light scuffing and light wear to corners, light soiling outer edge of pages. Pages are all intact and clean other than old price and small stamps inside covers. 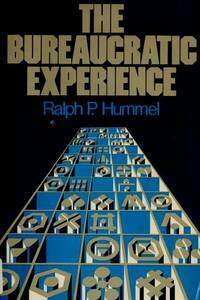 Contents: Understanding Bureaucracy; Bureaucracy as the New Society; Bureaucracy as the New Culture; The Psychology of Bureaucracy; The Language of Bureaucracy; Bureaucracy as Polity & Bureaucracy: The Terminal World. (360os? ) ; 8vo 8" - 9" tall . Stoddart Publishing. Very Good+. 1993. Third Printing. Softcover. 0773755799 . Very light edge/corner wear to cover, light stain inside front cover. Pages clean - minor wrinkling to first few pages. 91 pages. The National Party of Canada. 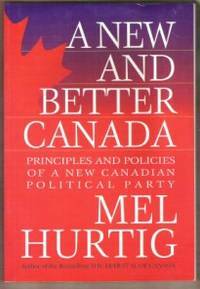 "A New and Better Canada spells out the policies and principles of a very different Canadian political party committed to: injecting integrity, honesty, and openness into government; ending patronage and the way money dominate politics; a much fairer tax system, etc...." [os]; 8vo 8" - 9" tall . 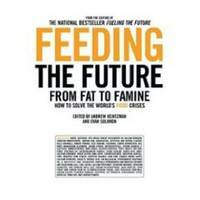 NJ: Humanities Press International Inc.. Very Good. 1986. First Edition. Softcover. 0391034286 . Light edge & corner wear, small corner creases, a little fading to spine area. Internal pages are clean except for a stamp from previous owner and some pencil writing inside back cover. Pages are otherwise tight and unmarked. "The author examines three historical views and puts forward arguments for his own conception of autonomy. He goes on to explore the extent to which liberal democracies apply their own official belief in the supremem importance of autonomy in practice by examining the treatment of children and the mentally disordered...." (*shipping will be reduced to some locations) [os]; 8vo 8" - 9" tall . Abacus. Very Good+. 1987. Softcover. 0349135975 . Very nice, tight copy. Laminated cover, light wear to corners/spine ends, a little soiling outer edge of pages. Internal pages clean & tight other than small stamp on endpage. " Walker combines the recent academic analyses of the Soviet Union with sharp journalistic pictures of what motivates everyone from army generals to black market criminals. A convincing and raedable account of Gorbachev's desire for reform and the massive potential of the Soviet Union to improve the quality of life of its citizens. "; 8vo 8" - 9" tall . Douglas & Mcintyre. Very Good+. 1997. First Edition. Softcover. 1550544349 . Clean, tight condition. Ex-library with sturdy laminated cover & usual type markings. Overall wear is very light. "It is a pleasure to hitch a ride on this brave and unpredictable journey from the safe certainties of extremism towards the tumultuous terrain of individuality, democracy and compassion. Canada just got bigger. " --Naomi Klein, Toronto Star Columnist (300-osl) ; 8vo . D. C. Heath. Good+. 1970. Softcover. Cover has moderate edge & corner wear, a little scuffing and very small peeled area on front, tiny tears spine ends. Pages are tight and clean, however approx. 8 pages have highlighting on them. 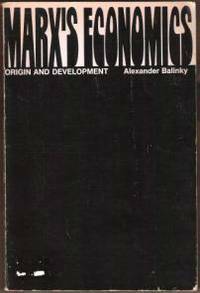 Contents: The Essence of Marxism; The Hegelian Base of Marxism; Marx's Theory of History: Its Principal Tenets; Marx's Theory of History: An Overview; The Marxian Law of Value; The Subsistence Wage; Surplus Value; Marx's Theory of Value and Price etc. (*shipping will be reduced to some locations) ; 8vo . Moscow: Progress Publishers. Very Good. 1970. Softcover. B000XY81IQ . Progress Publishers 1970 edition. Reprint. Light edge and corner wear, fading to edges, a little creasing small tears spine bottom. Internal pages tight and clean. 132 pages. Translated from the Russian. (osl) ; 8vo .